Abdul Razak Alhassan caught Sabah Homasi flush with a right uppercut in the first round for one of the more spectacular knockouts in recent UFC history to win a welterweight bout at UFC 220 on Saturday night. Razak Alhassan knocked Homasi cold with a vicious right that brought a gasp from the sellout crowd at TD Garden. Homasi was motionless on his back for a couple of minutes and eventually needed assistance to sit on a stool in his corner. Trainers placed bags of ice on his back and neck. 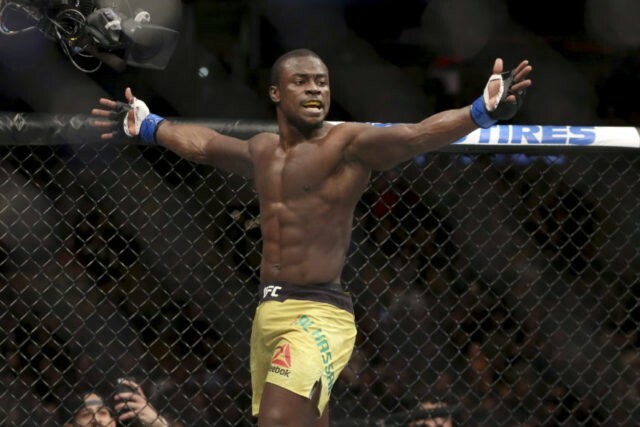 Razak Alhassan already beat Homasi in a controversial stoppage at UFC 218. UFC granted an immediate rematch and Razak Alhassan left no doubt about this outcome. Even with ferocious heavyweight puncher Francis Ngannou on the card in the main event, it’s going to be hard for any fighter to top Razak Alhassan’s KO. Kyle Bochniak, of Gloucester, Massachusetts, had the home crowd behind him in a unanimous decision win over Brandon Davis. The crowd roared for Bochniak’s walk to the cage and cheered when the decision was announced. The UFC had five fights ahead on the UFC 220 pay-per-view card. UFC 220 has some star power on the sidelines for the opening fights. Islam Makhachev needed just one left hand and 57 seconds to knock out Gleison Tibau in the first preliminary bout. Khabib Nurmagomedov was in Makhachev’s corner and pounded a wall in celebration of his fellow Russian fighter’s victory on Saturday night. Nurmagomedov is set to fight Tony Ferguson for the interim lightweight title at UFC 223 in New York. UFC President Dana White has refused to strip inactive champion Conor McGregor of the lightweight title. Nurmagomedov’s second fight in UFC was a victory over Tibau. Tibau made his return following a two-year doping suspension. Enrique Barzola defeated Matt Bessette by unanimous decision in another of the prelim fights. Julio Arce beat Dan Ige by unanimous decision in a bout between two fighters making their UFC debuts. Dustin Ortiz also snapped Alexandre Pantoja’s 11-fight MMA winning streak dating to 2010 with a unanimous decision victory. UFC is back in Boston. The top MMA promotion returned to TD Garden Saturday night with the heavyweight and light heavyweight belts on the line on the same card for the first time since 2003. Stipe Miocic (17-2) looks to set a UFC heavyweight division record with a third straight successful title defense when he fights Francis Ngannou (11-1). The 31-year-old Ngannou hasn’t needed to go beyond the first round in any of his last four bouts and has never gone past the second in his 12 pro fights. Ngannou fights just seven weeks after his stunning victory of Alistair Overeem at UFC 218. Daniel Cormier (19-1) defends the light heavyweight title against Switzerland’s Volkan Oezdemir (15-1). UFC held its fifth card at TD Garden, the first since 2016, and the company said the arena was sold out.